The current Grand Marais scenes for this month include pictures taken at the beginning of the month before I went downstate to conduct the Gitche Gumee Gatherings. As part of my continuing new exercise routine, I walked across Sable Dunes to get the picture of the dunes and iceberg row. 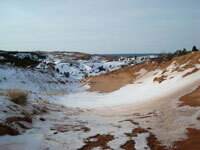 I just love the dunes in April with the contrasting colors of sand and snow. The Iceberg Splash photo was taken from the beach in front of Woodland Park. The Snow Trees picture was taken on H58 East just past the school forest. That blizzard dumped well over a foot of heavy snow, which caused a power outage for 1-2 days, depending on which side of town you live on. This scene certainly looks more like January than it does April.